Thanks for visiting. 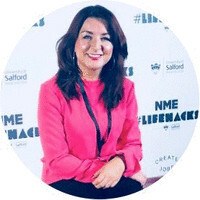 I’m Dr Kirsty Fairclough, Associate Dean: Research and Innovation in the School of Arts and Media at the University of Salford, UK and Chair of the University Women’s Voice Network. I have published widely on popular culture and am the co-editor of The Music Documentary: Acid Rock to Electropop (Routledge), The Arena Concert: Music, Media and Mass Entertainment (Bloomsbury) and Music/Video: Forms, Aesthetics, Media. New York, (Bloomsbury) and author of the forthcoming Beyoncé: Celebrity Feminism and Popular Culture (I.B Tauris) and co-author of American Cinema: A Contemporary Introduction (Palgrave). My work has been published in Senses of Cinema, Feminist Media Studies, SERIES and Celebrity Studies journals and I have made several television and radio appearances. I lecture internationally on popular culture, feminism and representations of women most notably at The Royal College of Music, Stockholm, The University of Copenhagen, Second City, Chicago, Columbia College Chicago, Middle Tennessee State University, Unisinos Brazil and Bucknell University, Pennsylvania. I have significant experience in international partnership development, particularly in North America and developed the Salford Popular Culture Conference series with international partner universities, including I’ll See You Again in 25 Years, Twin Peaks and Generations of Cult Television: A Two Day International Conference (University of Salford, May 2015) and Mad Men: The Conference (Middle Tennessee State University, May 2016) and Purple Reign: An interdisciplinary conference on the life and legacy of Prince, a three day international academic conference hosted by the School of Arts and Media, University of Salford, UK and the Department of Recording Industry, Middle Tennessee State University, USA. • Celebrity culture and gender representations. • Ageing narratives and female celebrity. • Beyoncé and celebrity feminism. • Music video and representations of female sexuality. • Gender and contemporary Hollywood stardom. • Television comedy and gender. My teaching and supervision ranges across both undergraduate and postgraduate levels and spans performance, film, media and cultural studies. My research covers an inter-disciplinary field across cultural studies, media studies and film studies, with a particular focus on representations of female celebrity and stardom, stand-up comedy and gender, music video and representations of female sexuality, and gender and the contemporary Hollywood film industry. Other research interests lie in the areas of online celebrity gossip discourses, music documentary and music video. I supervise a number of PhD students and welcome applications related to my research interests.